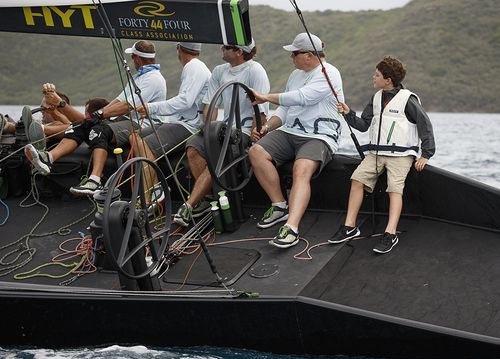 Conditions on the penultimate day of the RC44 Virgin Gorda Cup turned volatile, reminding competitors that this exotic venue, while balmy and hot, is also in the centre of the Caribbean Trade Winds belt, complete with gusty winds and tropical rain showers. Both featured today, with 30 knot gusts and intermittent downpours that closed down visibility and caused dramatic fluctuations in the wind. 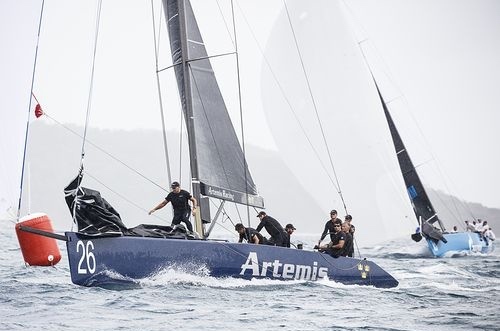 As a result just two races were held before a bigger, more intense deluge dumped its load on the North Sound race course and racing was abandoned for the day. 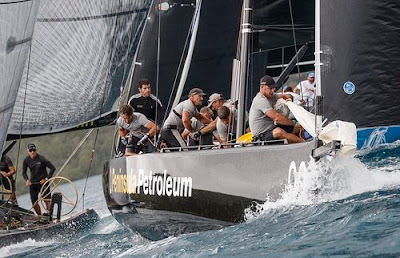 Despite the tricky weather, star performer today was John Bassadone's Peninsula Petroleum posted a 1-2, elevating them to second overall, five points behind the ever-consistent leader, Artemis Racing. "It was a pretty tough first beat, but we managed to get into a good position. It was very shifty, but we gybed early on the first run. Thanks to Vasco [Vascotto], our great tactician - he saw that and it proved a very good move. It was very tricky, trying to stay ahead in this type of course: One minute you think you are in a good position and then the wind shifts 30°," Bassadone said. Peninsula Petroleum was in second to Katusha most of the way around the course and managed to overtake her on the second upwind. But Bassadone was prouder to have finished second in race two. "It was tougher, and it could easily have been a fourth or even a sixth. We did very well to recover. On the second half of the first beat it was all over the place - very shifty - and we just managed to get ahead. In this fleet, sometimes the difference is literally down to three meters whether you cross or don't cross someone." While Peninsula Petroleum is out of the chocolates in this year's overall Fleet Racing Championship, she is now gunning for the regatta lead. However Artemis Racing, with Torbjörn Törnqvist steering and Italian Francesco Bruni calling tactics, seems unstoppable, winning today's second race by a giant margin. 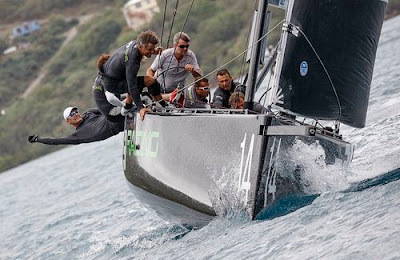 A more surprising stand-out performance today was Krzysztof Krempec's MAG Racing which finished third in the first one – their best result this season – and were lying second in race two until they were penalised after their spinnaker touched Peninsula Petroleum during the hoist on the second downwind. "It was crazy weather, but it appears we like this! It is similar weather here to Poland in November - every day it is raining and there is lots of wind, only it is 30°C colder. Today we made good decisions for our tactics. I'm not satisfied, because of the penalty, but generally we are very happy. We had fun. I am smiling: It is a good prognostic for tomorrow," Krempec said. His Croatian tactician, Tomislav Bašić provided the overview: "In the last two events, I feel that we are getting stronger. It is just a matter of time as to when it comes together." The prize for the biggest comeback today goes to Igor Lah's Team CEEREF, which, along with Katusha, was OCS at the start of race two and yet pulled through to take third. "We just chipped away at it. We saw 40° shifts, but the big one was the pressure on the run being really up and down, because it was so squally. Due to the variance in wind speed we could be doing nine knots or 17. If you got it right there was a fairly big difference," said tactician Adrian Stead. Currently lying sixth, Chris Bake's defending champions on Team Aqua appear to be out of running. "We are holding our own…just. It is good fun out there. Because it is so shifty there are lots of opportunities to do very well or very badly, It has been an erratic year. I haven't been around much. At every regatta we've had a different helmsman and we've had a lack of practice while the fleet keeps progressing. 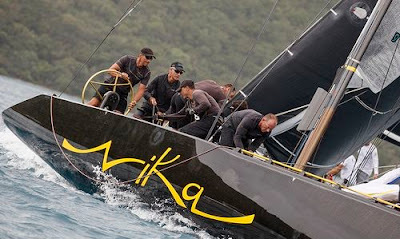 Other boats have committed time and energy this year - like Bronenosec, Team Nika and others – and that is paying off," Bake said. 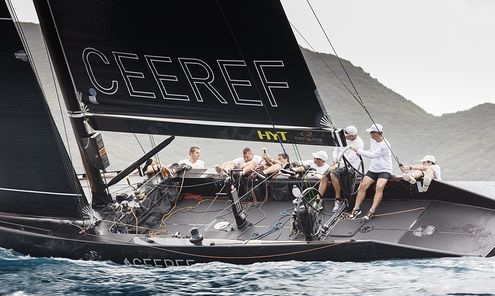 One skipper for whom it will be a case of 'early to bed' tonight will be Team Nika's Vladimir Prosikhin, who came into this regatta leading the RC44 Fleet Race Championship, but is in danger of losing this to Bronenosec Sailing Team. In this regatta, his rival is currently third, four points ahead of Team Nika in fourth and who beats who tomorrow will determine the outcome of the overall championship. "We haven't focussed on Bronenosec yet, but we'll have to consider for tomorrow. Basically we have to beat them," acknowledged Prosikhin.